Find out more about Napa from the (707/226-7459). Thomas Keller had other plans for the space when he started serving a $45 four-course menu in the simple dining room. The ad hoc menu is now permanent. INFO: $$$$; 6476 Washington St., Yountville; 707/944-2487. Authentic Italian fare in a setting that spectacularly shows off the valley. INFO: $$$; 4110 Howard Lane, Napa; 707/224-3300. True West for wine lovers: beer-can chicken, ribs, and tangy pulled-pork sandwiches served under pounded-tin ceilings. INFO: $$; 975 First St., Napa; 707/226-3976. In a charming two-story house in downtown St. Helena, prominent Napa Valley restaurateur Cindy Pawlcyn serves California comfort (meat loaf, tamales) with a Southern twist. INFO: $$$; 1327 Railroad Ave., St. Helena; 707/963-1200. Rib-eye, porterhouse, New York: At the upscale steakhouse, all the important decisions revolve around beef. The sides are traditional (creamed spinach, onion rings) and the setting–especially the patio–attractively casual. INFO: 1122 Main St., Napa; 707/224-6328. Cindy Pawlcyn has filled the longtime Napa Valley need for a good seafood restaurant. INFO: $$$; 641 Main St., St. Helena; 707/963-0700. From chef Todd Humphries and designer Pat Kuleto comes the best sort of wine-country restaurant, favoring foraged and organic ingredients. INFO: $$$$; 1245 Spring St., St. Helena; 707/963-2233. The finest ingredients to be had are cooked simply at the warm, stylish steakhouse. New York strip and rib-eye are standouts, and potato cake is always in season. INFO: $$$$; closed Tue; 587 St. Helena Hwy. S., St. Helena; 707/967-0550. With his history as chef at Auberge du Soleil, Richard Reddington brings an air of Napa Valley royalty to his namesake restaurant. Four- to nine-course tasting menus. INFO: $$$$; 6480 Washington St., Yountville; 707/944-2222. Come all the way to Napa Valley for a burger and a shake? Yes, when it’s the Wisconsin sourdough burger and black-and-white shake at the valley institution. INFO: $; 933 Main St., St. Helena; 707/963-3486. In an old stone building a block off Main Street, Hiro Sone—one of the pioneers of Asian fusion—combines California cuisine with Japanese ingredients. INFO: $$$$; closed Tue; 1345 Railroad Ave., St. Helena; 707/963-8931. 1. One of the most serene spots in the valley. Wander around spring-fed Jade Lake and taste lauded Chardonnays in the ivy-draped 1880s stone castle. INFO: 1429 Tubbs Lane, Calistoga; 707/942-5105. 2. The striking “temple to wine and art,” designed by architect Michael Graves, houses an art collection but is itself the real work of art worth stopping for. The Mitsuko’s Vineyard wines are special. INFO: 1060 Dunaweal Lane, Calistoga; 707/942-4981. 3. Jack and Jamie Davies pioneered sparkling-winemaking in the valley. The tour here gives you a look at a mind-boggling 2 million bottles of bubbles in 2 miles of underground caves that were dug out in 1862. INFO: 1400 Schramsberg Rd., Calistoga; 707/942-2414 (call for appointment). 4. The oldest continually operating winery in the valley, and a St. Helena landmark, Beringer offers a whole menu of tours; its Rhine House and wine caves are synonymous with Napa history. INFO: 2000 Main St., St. Helena; 707/963-7115. 5. Though the terra-cotta-tiled monolith is owned by the Gallo family now, the legacy launched by Louis Martini in 1933 lives on in the remodeled tasting room. INFO: 254 S. St. Helena Hwy., St. Helena; 707/968-3361. 6. Cathy Corison makes elegantly lean, almost Old World-style Cabs in her graceful barn of a winery. INFO: 987 St. Helena Hwy., St. Helena; 707/963-0826 (call for appointment). 7. One of the all-around-good tasting rooms on State 29—sleek and warm, with knowledgeable comments offered by the staff. Mount Veeder Winery (which has the same parent company) pours here too; it’s worth the extra fee to taste the reserves. INFO: 1178 Galleron Rd., St. Helena; 800/529-9463. 8. There’s only one wine here, and it’s expensive, but worth an appointment for a sit-down wine-and-cheese tasting and a tour of the stone-and-concrete gravity-flow winery. INFO: 1601 Silverado Trail, Rutherford; 707/967-1601 (call for appointment). 9. The new hospitality center at the earth-friendly winery was built with highly renewable, low-impact materials; it hasn’t lost its rustic farm feel. INFO: Closed Sun; 8815 Conn Creek Rd., Rutherford; 800/959-4704 (call for appointment). 10. The hospitable hexagonal tasting room is modest, though the history of Napa wine masters who’ve worked in the historic stone building next door—including the legendary Russian-born André Tchelistcheff—is not. INFO: 1960 St. Helena Hwy., Rutherford; 800/373-5896. 11. No wine-gadget folderol in the redwood tasting room—just wine and a young crowd talking about it. Mike Grgich made the Chardonnay that beat out the white Burgundies in the landmark 1976 Paris tasting. INFO: 1829 St. Helena Hwy., Rutherford; 800/532-3057. 12. A must-visit if you’re looking for Napa’s roots. The chateau, built by sea captain turned wine pioneer Gustave Niebaum, has watched over the valley since 1880. Movie director Francis Ford Coppola bought the estate in 1975 and reunited all the original vineyards. The $25 entrance fee is steep, but the tour, tasting, and mini museum of winemaking are rich. INFO: 1991 St. Helena Hwy., Rutherford; 800/782-4266. 13. The large, airy visitor center offers as wide a range of experiences as any in the valley, from self-guided tours across the winery’s catwalks to cheese pairings and grape stomps. The Sauvignon Blanc is one of our perennial favorites, but also try the red and white meritage blends. INFO: 8440 St. Helena Hwy., Rutherford; 800/942-0809. 14. The busloads across the road at Robert Mondavi Winery might be getting a good wine education, but at this winery founded by Robert Mondavi and the Baroness Philippine de Rothschild, you can taste Napa’s version of a grand cru. INFO: 7900 St. Helena Hwy., Oakville; 707/944-9442 (call for appointment). 15. Billionaire Gordon Getty and San Francisco mayor Gavin Newsom are behind the Jack Falstaff fun here (the winery is named for Shakespeare’s stout funny man). The signature Cab was the first high-end red to go to market under screw caps. INFO: 620 Oakville Cross Rd., Oakville; 707/945-1220. 16. Leslie Rudd is a relative newcomer among Oakville Cross Road’s royalty, but he’s already producing first-class wines. Tasting here is an event for those who want a serious look: Take a full tour, which ends with food-and-wine pairings in the cave, or arrange to taste just the wines. INFO: Closed Sun–Mon; 500 Oakville Cross Rd., Oakville; or 707/944-8577 (call for appointment). 17. Panoramic views from the terraces, as well as extensive caves, which you can make an appointment to tour. A wide range of top-notch wines is crafted here, from Viognier to a lovely dry rosé; the classic Oakville Cabernet is a standout. INFO: 7850 Silverado Trail, Oakville; 800/366-9463. 18. A tall redwood nave rising from low stone walls creates an earthly cathedral of sorts. Within, nibbles in hand, taste beautifully crafted biodynamic Pinot Noirs. INFO: 6320 Silverado Trail, Napa; 800/869-2030. 19. The deceptively simple Craftsman tasting room gives way to a beautiful little art gallery and a courtyard that keeps its serenity in the busiest Napa seasons. INFO: 1473 Yountville Cross Rd., Yountville; 800/428-2259. 20. Napa’s newest, Quixote is the 20-year project of Carl Doumani. Designed by Viennese iconoclast Friedensreich Hundertwasser; wild splashes of tile, gold-leafed domes, and no straight lines or square angles. INFO: Closed Sun; 6126 Silverado Trail, Napa; 707/944-2659 (call for appointment). 21. No bells and whistles but serious pedigree. In the tasting room, which hugs the fermenting tanks, you can usually try “Cask 23” and “S.L.V.” sourced from the vineyard that produced the Cab that bested Bordeaux in the 1976 Judgment of Paris tasting. INFO: 5766 Silverado Trail, Napa; 866/422-7523. 22. A beautiful introduction to the valley and to sparkling-winemaking. Take a look at riddling and blending techniques before you order appetizers in the salon. INFO: 1 California Dr., Yountville; 707/944-2280. 23. Maybe the only winery perch in the valley that looks out over an infinity pool, Signorello has become a stop for food mavens. And with no new oak in it, the Chardonnay here is food-friendly too. INFO: 4500 Silverado Trail, Napa; 800/982-4229 (call for appointment). 24. “Stunning” is usually an exaggeration; not here. You can spend quite a bit for cheese-and-wine “experiences” and tours, or share the hefty fee for a standard tasting and feel like royalty for an hour. INFO: 4240 Silverado Trail, Napa; 707/257-2345. 25. “Collection” refers to the dramatic art pieces in the multilevel gallery that holds the winery. The wines here have been getting better and better—the best being from the Mt. Veeder vineyards just outside. INFO: 4411 Redwood Rd., Napa; 707/255-1144. 26. A replica of the French Taittinger family’s 17th-century stone château in Champagne, Domaine Carneros has a grand terrace for sipping the good bubbly it makes. 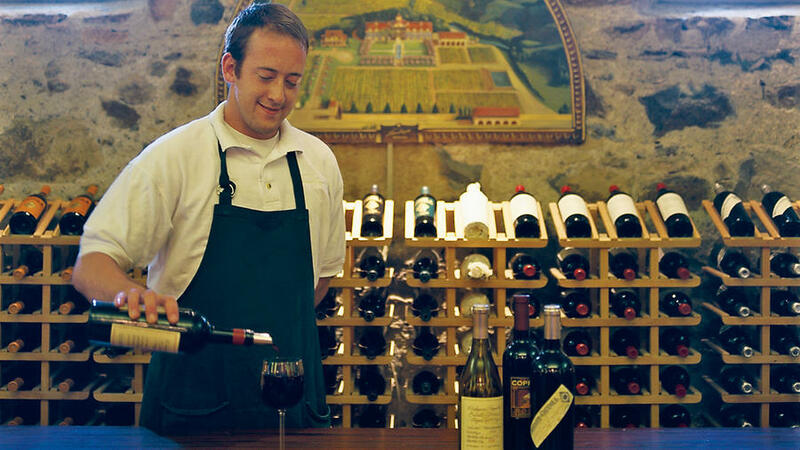 Splurge on a bottle of “Le Rêve.” INFO: 1240 Duhig Rd., Napa; 707/257-0101. The Rutherford resort has large rooms, stunning views, and a notable restaurant ($$$$). Its sister property, (89 rooms from $325; 866/942-7442), is set to open in July and is designed for a younger crowd with shallower pockets. INFO: 50 rooms from $600; 800/348-5406. A sibling to Auberge du Soleil, the resort rests in a 157-acre canyon in the mountains east of Calistoga. Secluded and luxurious, it has its own spa along with 4 miles of hiking trails. INFO: 46 lodges from $625; 800/942-4220. The board-and-batten cottages hark back to Napa’s agrarian past but offer contemporary luxury. INFO: 86 cottages from $480; 888/400-9000. These newly renovated Provençal-style cottages near Yountville are affordable, as far as Napa prices go, providing the sort of privacy and personal touches you can’t find at larger resorts. INFO: 8 cottages from $325; 707/252-7810. Go for “The Works,” a traditional mud bath with facial mask, aromatic mineral whirlpool bath, steam room, massage, and blanket wrap at the Calistoga classic. INFO: 42 motel units from $129, plus cottages and bungalows; 707/942-4102. For years St. Helena’s motel with the neon sign and the retro road-trip vibe was a cherished Napa Valley secret. Now the word is out, which means you’ll need to book in advance. INFO: 42 rooms from $135; 707/963-3216. Comfort, style, and world-class views (and wine cellar) in the Stags Leap District. INFO: 3 rooms from $590; 707/944-0646. Ballooning Float over Napa with ($234; 800/464-6824) or ($230; 800/253-2224). (See map.) INFO: 2555 Main St., St. Helena; 707/967-1010 (restaurant reservations), 707/967-2320 (cooking-demo reservations). Don’t tell New Yorkers, but the St. Helena branch of Manhattan’s foodie mainstay may be even more alluring to palates (and wallets) than the SoHo original. INFO: 607 S. St. Helena Hwy., St. Helena; 707/967-9980. (See map.) INFO: 5200 Carneros Hwy., Napa; 707/226-5991. Napa Valley’s backroads are ideal for cycling: quiet, mostly flat, and beautiful, albeit often clogged with traffic. Rentals (from $20) and guided tours (from $99). INFO: 6488 Washington St., Yountville; 800/707-2453.